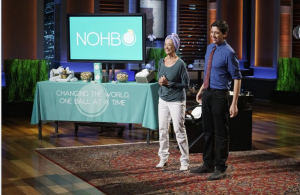 On a recent episode of Shark Tank, 16-year-old Benjamin Stern presented a unique product to the investors that could potentially reshape the personal care industry. Gaining inspiration from the impact of plastic on the environment, Benjamin founded Nohbo, LLC and created an eco-friendly shampoo ball that doesn’t need a plastic container. It comes in a completely waste-free wrapper, made from plant-based compostable materials that have an insignificant effect on the environment compared to plastic bottles. By adding water and friction to the ball, it activates the particles inside to dissolve and become the texture of regular shampoo. Due to recent global changes people are starting to care more and more about promoting sustainability, especially by buying products that don’t leave a foot print on the environment. This change is an important part of the purpose of Nohbo, and will drive sales upward in the long run when even more people start caring about the environment. This company is in a lucrative market because Americans, on average spend 10.6 billion dollars on shampoo and conditioner per year, which creates an enormous amount of plastic waste. For example, the amount of shampoo bottles thrown away in a year could fill 1,164 football fields. Benjamin’s hard work to create an eco-friendly formula could pay off extremely well if he can tap into this market. Since taking Mark Cuban’s deal of $100,000 for 25% of Nohbo, Benjamin has received many investment and distribution offers. He is currently working on reducing retail costs to 20 cents per ball and finalizing plans to add conditioner, body wash, and shaving cream to his product line. The development of this idea by such a young and talented individual shows that anything can be achieved if you put effort into it. Age should not stop people from pursuing their dreams or business endeavors. It also should not be a reason for people to disregard the ideas of individuals like Benjamin, who might not have the same level of authority, but can develop ideas that benefit society.